No on 66-67 posters released. Campaign heats up. 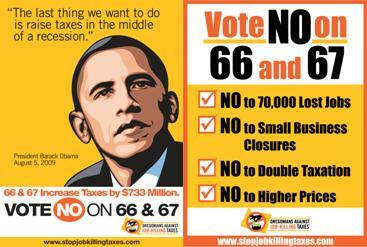 Oregonians Against Job Killing Taxes has come out with their posters to help defeat Measure 66 and 67 the two referendum ballot measures that raise business and income taxes on Oregonians. One of the posters has President Obama’s own words where he aptly said, “The last thing we want to do is raise taxes in the middle of a recession”. Who are we to question Obama’s judgment? The other poster warns about 70,000 jobs lost, business closings and double taxation. Both are a little larger than traditional signs (18″ x 24″) and the campaign is hoping people place them on business windows and other high visibility areas. Because the campaign rolls right through Christmas, will the public dare to errect political posters next to Santa? . The tension of this race will only get stronger every day now until election time. You can download further information on the posters here.